Havdalah, from the Hebrew for “separation,” is a traditional religious ceremony marking the end of Shabbat and other Jewish holidays. Saying a fond farewell to Shabbat is always bittersweet and some Jewish communities even delay observation of Havdallah in order to prolong the days of rest, but Havdalah is a harbinger of a new week and new opportunities to live under the Lord’s blessings. The selection of complete Havdalah sets at Zion Judaica helps you ring in the new week with an elegant touch. We have a large stock of Havdalah sets in basic and ornate styles. We have beautiful sterling silver Havdalah sets, pewter Havdalah sets and durable anodized aluminum Havdalah sets in an array of colors. We have striking painted ceramic Havdalah sets as well as wooden Havdalah sets painted with vibrant designs. Our carved wood sets come in a range of original styles that are sure to become conversation starters in your home, and they are only part of our larger selection of unique Havdalah sets that depart with tradition to meet with style. Zion Judaica is particularly proud to offer a selection of artisan Havdalah sets handcrafted with premium materials by respected Israeli designers such as Yair Emanuel. 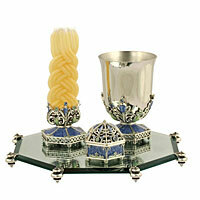 We also carry decorative glass Havdalah sets to make an elegant display. We are the exclusive domestic provider or direct producer of many of our products, so you won’t find our pieces anywhere else. Find a great start to every new week in our huge inventory at Zion Judaica.